West Palm Beach is a coastal town in South Florida with a temperate climate. It has undergone a tremendous renaissance in the past ten years with a revitalized downtown lining the waterfront area. There are miles of sunny beaches and waterways for activities such as boating, fishing, water skiing, surfing and scuba diving. You'll find renowned art galleries, antique districts, green markets featuring locally grown foods, and free weekly concerts and special events. There's also plenty of secret gems and places that only the long-time locals know about. 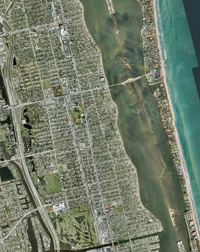 Now you can explore the best of West Palm Beach in high-resolution satellite view! After you have installed Google Earth, click on the file below to open or download it. Once you have it on your desktop, you can just double click on it to launch Google Earth and begin your tour!